Odon Winkelpleck Public Library: Big Book Sale this Saturday! 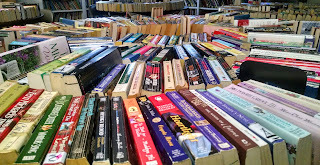 Big Book Sale this Saturday! The Friends of the Library winter book sale will be held in the library community room on Saturday, January 23rd from 9 to noon. Books, magazines, and videos are all $2/bag. Bags are provided. Enter at the east door (by the Odon Pharmacy). Please drop off donations by Thursday evening.